After visiting Maryland and Virginia, my boyfriend and I continued our November road trip driving through North Carolina. We stopped overnight at a B&B in Henderson, where we also had dinner; the next day we drove to the Charlotte speedway for a behind-the-scenes Nascar tour. I'm a huge fan of the Hunger Games so when I discovered the first movie was filmed mainly in and around Asheville, North Carolina - which was already on our itinerary before I knew this - I decided we had to stop at one of the locations. Henry River Mill Village is just off one of the interstates but you would never know - it's a group of abandoned buildings, most of which are boarded up, and it was used as the set for District 12. The film crew added the word 'pastries' and 'bread' to the front of one, to make it into Peeta's family's bakery. And here I am sitting on the doorstep, waiting for Katniss! We then stayed two nights in Asheville, visiting the Thomas Wolfe Memorial - the home of one of my favourite authors. Again, we had already decided to visit Asheville before I knew that this was the real name of "Altamont", the town in Wolfe's highly autobiographical novel Look Homeward, Angel. You can visit the boarding house that is such a key part of the story. Finally we went to the Biltmore Estate, which I was really looking forward to as I had kept hearing that it is America's largest house. Built by the Vanderbilts, the house is now open to the public and you can also visit other parts of the estate including the winery. But I have to say we were a little underwhelmed. In England we are spoiled with stately homes and palaces, and as a child I spent a lot of time in places like Wilton House and Longleat, so we didn't get overly excited about Biltmore. It was interesting, and it is certainly a big house, with 250 rooms - but given a lot of rooms were designed to replicate English stately homes, I think it is probably more interesting to Americans than it was to us! We decided to stay one night in Henderson as it was a good distance between Richmond, VA and Asheville, NC. I asked the owner of the B&B we had booked if she could recommend somewhere we could stop for dinner before we checked in to stay the night, and she recommended George's. It doesn't look much from the outside but we were impressed with the food and the service. 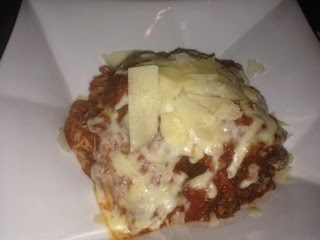 There was a lot of choice on the menu - mainly Italian and American dishes - and the portions are huge. 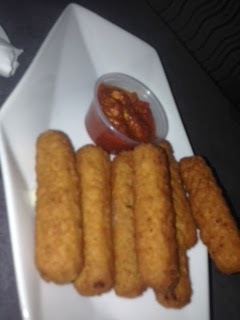 We had mozzarella sticks to start and I helped myself from the salad bar which was included with my main course, then my boyfriend wanted a pizza. He chose the large one, even though the menu did imply this was quite big and there was a smaller option available - as he does have a big appetite - but he couldn't eat more than about half. I had chicken Milanese - in breadcrumbs - served on a dish of spaghetti in tomato sauce, with grated cheese on top. 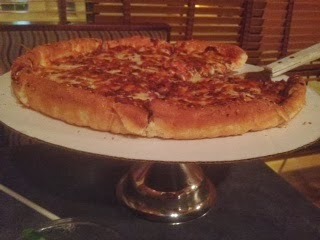 It was delicious but again a huge portion and I could only eat half! It was good value as well - the bill came to about $50 including soft drinks (with free refills) and tip. It was dark as we arrived, and for some reason the sat nav could not pinpoint the exact location of the property so we were driving along a very dark road trying to read signs and work out which one it was - luckily, they have a big sign outside which we did manage to spot (but only as we went past to had to turn around!). The owners came out to greet us, as did the neighbour's dog who was lovely and very friendly (the owner actually came out to make sure the dog didn't bother us I think). They were really nice people and had a lovely home; they gave us a wifi password and asked what time we wanted breakfast and showed us an area on the ground floor where we could make drinks if we wanted, and help ourselves to snacks. Our room was nicely decorated in pastels and white and had a slightly vintage chintzy effect, though there was also a flat screen TV on the wall and a large bathroom. It was a really nice place to stay and we admired the outside of the property the next morning as we left. As mentioned above, we were doing a behind-the-scenes tour of the Charlotte Nascar track which was a lot more interesting than I expected, given I am not a motor racing fan. We went into the media centre and radio recording booth and were allowed to sit in the chair and put the headphones on, and we went up into the stands and the executive suites. You can also have your photo taken on the winners' podium. The best part though was driving around the track; I didn't know it was tilted around the sides, apparently at a 22 degree angle. Even though we were in a minibus we went at a pretty good speed and it feels really strange driving at that angle then it feels really strange again when you go back onto the flat! There was a lot of information and detail that was lost on us as we'd never heard of all the drivers our tour guide mentioned but it was still interesting and I think it would be excellent if you were a real Nascar fan. We ate lunch at the restaurant there beforehand; it looks like a really high end restaurant when you walk in but the menu is very varied and reasonable. 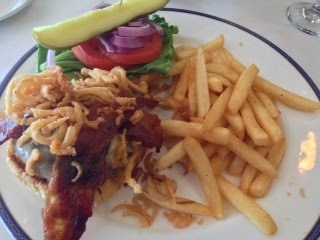 I had the cowboy burger - BBQ sauce, sliced bacon, smoked gouda and fried onions on a toasted onion roll, which was good and well priced at $12. You can also enjoy the view over the racetrack while you eat. We spent two nights at this B&B just outside Asheville, surrounded by beautiful mountain scenery. We had to drive along a narrow winding road up into the woods for a few minutes but the B&B is really well signposted. We thought this was a very well run and well designed place- the owners Doug and Jodee had it built from scratch and Doug made the staircase and a lot of the furniture himself. There was a large living room upstairs and another one downstairs where our bedroom was, with a TV and drinks including a fridge full of soft drinks (sodas) which I thought was a nice touch. Doug and Jodee also provide two folders full of restaurant menus, and pre-printed directions to each restaurant, which is a massive help when you don't know the area and want to find somewhere to go for dinner. 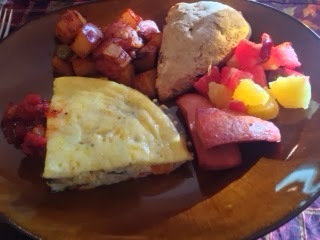 Breakfast was excellent - there was someone working in the kitchen in the morning (no sign of Doug and Jodee or their dog) who made us a sort of quiche with some sausage, fried potatoes, something that ressembled a scone and some fruit. We had to leave early on the second day and miss breakfast, so Doug very kindly left out some travel cups so we could make tea or coffee and take with us. I was impressed overall at both the accommodation and the service and would definitely recommend staying here if you are ever in the area. We chose this restaurant from the menus that Doug and Jodee had provided. It was fairly easy to find but is on a main road and we drove past it before we realised; you have to go up quite a steep driveway off the main road into their car park. There was plenty of parking which is good, and the restaurant is quite big and decorated with a lot of Black Forest memorabilia, which I quite liked as I used to live in Freiburg. The menu is a mixture of German, American and Italian; I had the pecan-encrusted west North Carolina mountain trout, which was an unusual combination (other than a little butter it was basically fish with chopped nuts on top) but very nice; it came with a choice of potato so I had a baked potato, and a small portion of vegetables. My boyfriend had a burger which was no surprise. 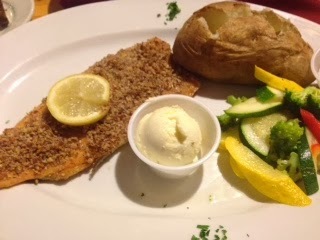 The service was good and the meal was reasonably priced - about $55 for us both including drinks and tip.